This year I met 2 fantastic bloggers! I received a gift box from Heather at: Double H Photopraphy She's a Rancher, A Journalist, A photographer.... the list goes on and on! She is one BUSY lady! I love her blog and the life she shares from Western South Dakota. Makes me miss my rural roots in Kansas! She sent me a treasure trove of gifts! 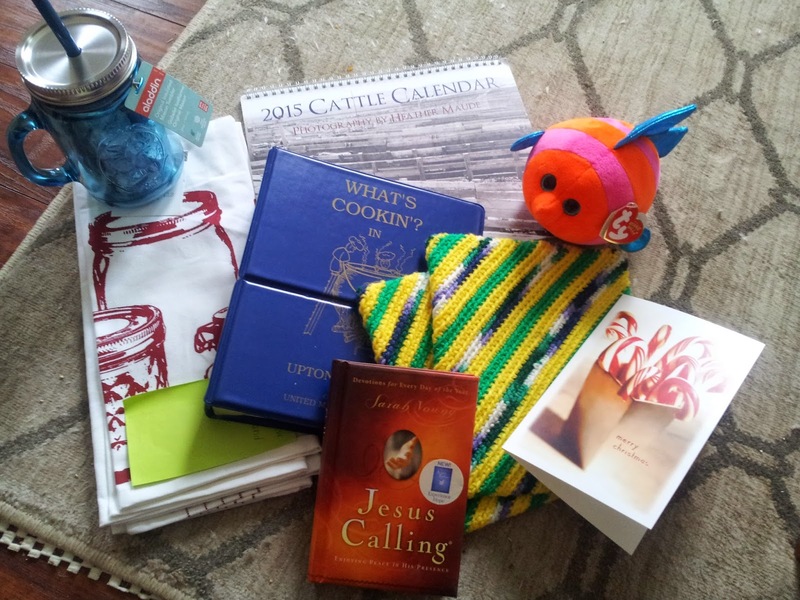 I feel she knows me so well already, and sent me just the perfect things to warm my heart!, She knew of my love for mason jars, cookbooks,devotionals, my new grandbaby... and threw in some extra's too! The Calendar is full of her own beautiful photography! Thanks Heather! Can't wait to keep in touch through our blogs and it was so great to meet you! The other great blogger I met was Erin from Missouri and she blogs over at: Diaries From The Dirt Road. Erin not only just finished nursing school, she is also the reigning 2015 Missouri State Honey Queen. I love her adventures as she balances school, life, and spreading the important business of preserving our Honey Bee's. I had the opportunity to send a few gifts to her. I tried to send a little bit from the state of Virginia where I live, along with a few things i thought she might enjoy! I hope she did! I loved all of my gifts and was so glad we were able to connect. Thank You for participating in Christmas in the Country! Looks like you got a fun variety of goodies from Heather. I'm sure you will enjoy these gifts all year round. How lucky to receive a calendar featuring western South Dakota cattle country. I, too, enjoy Heather's photography! Sounds like Erin really loved her package from you. I had a lot of fun! I have the calender right on my fridge for the year! Thank you Jan so much for joining us for Christmas in the Country! It has been a joy getting to know you. I too love Heather's photos. She has a wonderful talent and I am so glad she shared it with you. Don't forget to add you link to the linkup! I forgot about the link ! I found it and just got it done! Thanks for the reminder! Thanks so much for participating and sharing! Looks like you got a really great gift!